As guitarists, we tend to get comfortable with our playing at a certain level and not venture out of our comfort zones too often, especially if there’s no one close at hand that’s better than us. If, on the other hand, you do fancy taking a step outside your comfort zone, how do you go about it? If you’re anything like me, you probably want to do something radical that will give you some much-needed inspiration or insight into your playing. 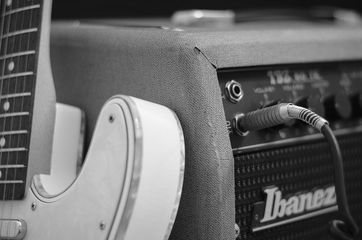 If you’re not like me, and you just want some kind of quick fix, do some ear training – it’s one of the few things that encompasses and improves all other guitar skills. But, for anyone who’s slightly masochistic, here are five things you could try. If you don’t fancy doing this at a gig, it’s a great thing to incorporate into your practice sessions because you start to do things with your fingers, the way you pick, bending, vibrato etc. that you don’t necessarily do when you have a magic box to stomp on that solves all your sound problems. Only the most highly adventurous players venture into this part of the neck where few know the actual names of the notes. Imagine what you could do up there if you knew what the notes were. In many guitar books, you’ll find the dreaded phrase, ‘Now learn this in all 12 keys’, and while you should probably do that, most guitarists don’t, and why would you if you’ve just learned a shape that can be shifted around from key to key without too much mental effort? There’s something deeply satisfying about playing a scale, arpeggio, chord or lick in all 12 tonalities: your hands start to hurt in a different (but good) way, you REALLY learn the shape or pattern, you build stamina, you feel like a real musician, and you feel strangely productive. So, choose your poison – 3NPS – the CAGED System – the 2 Position System – Pentatonics; and learn something in all 12 keys. If you’re wondering who the hell tunes in fourths for a living, check out Ant Law, Stanley Jordan, Tom Quayle and Alex Hutchings. Very few players do this but I highly recommend it. This is taking the concept of not being the classic too-loud, too-fast guitarist to the next level. Most guitarists come out all guns blazing, and by the third number in the setlist are scraping their barrel of tricks to impress the audience. What you want to do is hold back as much as possible, and try to go pretty much unnoticed for the first half of the set, then when you come back out, it’s time to tear into your bag of tricks. You’ll find that you’ll be able to execute them better because by the second half of the set you’re usually as relaxed as you can be and the time to insert all your favorite tricks is when everything is flowing nicely, not at the beginning when you’re desperate to impress.